Hailing from the Madagascar Islands is the massive and Jurassic Bismarck Palm Tree (Bismarckia nobilis). A palm tree that will grasp your attention at a moment’s sight. The Bismarck palm will gain your respect as it gracefully lines many grand hotels and many sub-developments in the south. Widely used for xeriscaping in southern California to Arizona all the way to Florida, the Bismarck will make a great impression and addition to any home. The Bismarck when fully matured can be a beautiful focal point to your yard or garden. The Bismarck Palm Tree also does well indoors, but due to its massive size, usually finds its ultimate home outdoors. It can grow to the maximum average height of about 60 ft but with plenty of time. 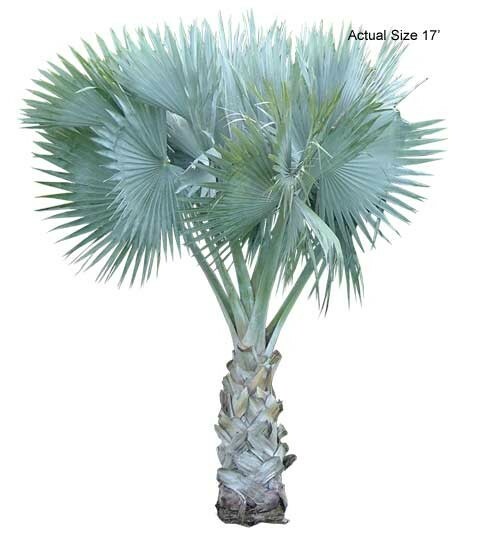 This palm tree is considered cold hardy to about 20 degrees F. More mature Bismarck Palm trees can with stand lower temperatures that of 20 degrees F. Each Bismarck has noticeable differences, from its small spots found on its stems to the different shades of green, silver, and bluish colors. The silver-blue leaves can make a dramatic appearance to any pool area, lawn, or backyard. 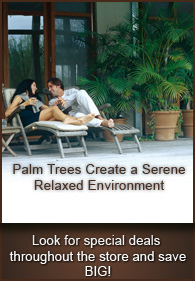 The Bismarck palm tree is the most sought after outdoor palm for its beauty an awe striking appearance.